"Heaven's Perch" Starry-Sky Sunrise View From Zion Overlook. If you speak German, you probably pronounced the title of this post properly, if not, you probably pronounced it along the lines of "I'm Freein." Im Freien [ihm (like him) fry-en] means in the open, or in the free. That's the title of a piece of German Lieder (art song) by Franz Schubert that I recently performed for a vocal master-class at UNLV. The translation of the text reads (summarized): "Outdoors in the expansive night, I stand ever at peace. The bright stars let my heart not rest... A thousand arms reach to me, beckoning me sweetly there... A thousand voices call me with a tender, loving sound. Oh, I know what my calling is. I know what my passion is. Like the sound of a dear friend's greeting, it calls me entrancingly through the air..."
I still remember the first time I ever saw a truly starry night sky. I was a young kid, probably about 8, and we were in Colorado visiting my grandparents. Before that I had always lived in areas where the light pollution prevented the true splendor of the night sky from being seen. I think it's a shame that some people have spent, and will spend, their entire lives in areas where they will never be able to see the milky way, or shooting stars. Now that I live in Las Vegas, I often feel stifled by the weight of the city, to the point where I have to get out every few weeks. 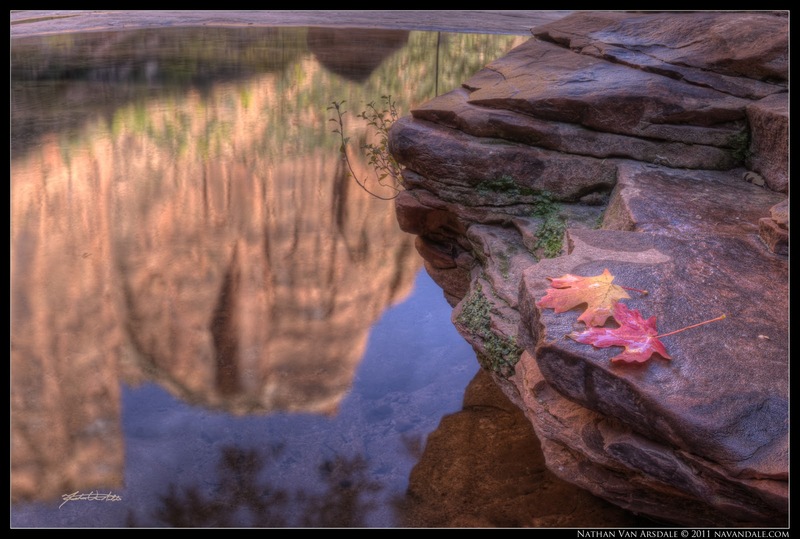 This past weekend I went to Zion National Park, which is just a couple of hours away from Vegas. I was hoping the fall colors would be at their peak, and though there was some color in various parts of the canyon, it looked like the peak of the season was still a couple of weeks away. I was also hoping for some clouds in the sky, rather than a boring blue sky... but apparently even the "cloud-whisperer" doesn't always get pretty clouds. None of that withstanding, I made the best of my time. I hiked about 22 miles over the weekend, through the grottos and Emerald Pools, up and down Angels Landing, and in and out of the Subway. Preferring to make lemonade rather than frown at the lemons I was handed, I decided to experiment a bit. 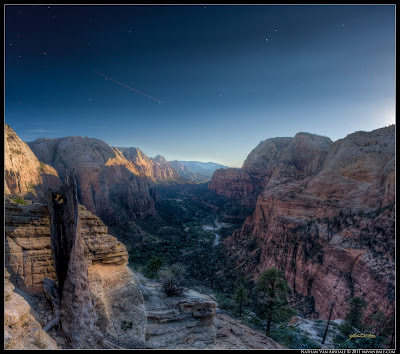 Knowing that I wasn't going to have any clouds for a pretty sunrise sky, I decided to show up at the Zion Overlook an hour beforehand to photograph the starry sky. Then, keeping the same composition, I photographed the sunrise, and later combined the images to make a beautiful sunrise photo with an interesting sky (top image). Later that day I hiked up to Angels Landing. This was my first hike up Angels Landing, a hike that warns not to bring children, or people afraid of heights. Personally, I think the warnings are a bit exaggerated, as it's a paved hike all the way up until the last quarter mile or so, and even then there are chain hand holds and steps cut into the rock. Nevertheless, I did encounter people who were just too scared to make it, and had to turn around and head back down. At least it was a good cardio-workout, well-worth it for the view. Towards sunset the sky teased me with some wispy stratus clouds, but they pretty much dissipated by the time the sun set. So, I figured I would photograph the sunset, then capture the sky an hour afterwards... I was prepared with my headlamp and extra batteries. It was totally worth the hour-long wait after sunset. As I was taking my second long-exposure of the stars, a meteorite buzzed overhead, so close I could almost hear it sizzle. Since I was shooting with my 15mm fisheye lens, the meteorite looks much smaller in the photo than it did when I was there... but you can get a sense of how incredible it was. Here is that image. After I sang "Im Freien," the guest artist who was running the master class commented, "Interesting poetry. Seems like kind of a weird person, huh? Maybe someone who isn't quite normal? Like maybe someone who had a little too much Absenthe?" "Perhaps." I replied. "And what do we normally call those people?" I thought to reply, "enlightened... transcendent" but before I could he answered himself, "Hippies." I chuckled a bit and furthered, "Or outdoor photographers." 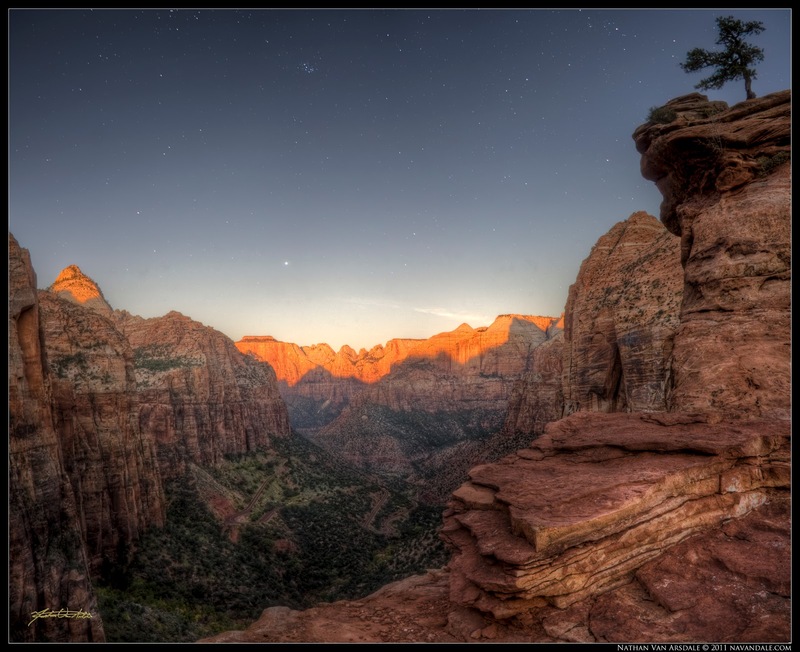 It's actually quite easy to add a starry sky to your sunset or sunrise image. First of all, I did my typical image capture process for the landscape scene. In other words, they are all High Dynamic Range images created from 3-RAW files (-2, 0, +2), processed in Photomatix Pro and Photoshop CS4. To see videos of my process, check out my earlier blog posts. For sunrise, be at your location an hour ahead of time, figure out the composition you will want, and aim your camera slightly higher than 2/3 of the top of that composition. With my Canon 40D I shoot a 30 second exposure of the sky at f2.8 ISO800, manually focused at just before infinity (not all the way to the end of the focus... the sky will be sharper). If I had a camera that handled noise better, I would crank up the ISO and increase the shutter speed to avoid the tiny star trails caused by the rotation of the earth. But I don't, and it doesn't make a huge difference, so I won't stress about it. Then, back down to ISO 100, f20, and whatever the exposure needs to be for that morning's sunrise. Capture your bracketed images. Same idea for sunset, only leave your camera in place after you capture the landscape, find some way to kill an hour, and come back and photograph the sky slightly higher than 2/3s of your original composition. Then, when you get home, process your HDR images so they look good with the boring blue gradient sky. Once they're processed and polished, create a new layer with the image of the starry sky. You will need to increase the top of your canvas size (CTRL[Command]+ALT+C) by a few inches... you can crop down later. Line up the bottom of your starry sky image with the top of the landscape portion of your lower image (horizon to horizon). They may not line up exactly due to lens distortion, which is ok. Change the blend mode of the starry sky to either lighten or screen, whichever one looks better to you. Instant magic, now you have a starry sky along with your landscape. You're not done yet. You may notice a vague outline of the lower horizon from your starry sky image... go ahead and mask that out. If you have a line from the top edge of your landscape image, apply a layer mask to it as well, and very lightly feather the edge away until it looks smooth. If you did your job right, you should have a seamless landscape image with a nicely graduated starry sky.